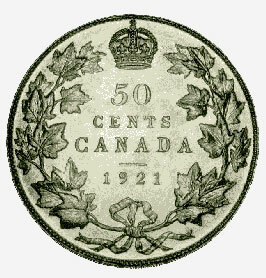 Canada's 1921 fifty-cent piece is a very rare coin; fewer than 200 are believed to exist. This is a direct result of the great variation in demand for fifty-cent pieces since their introduction in Canada in 1870. At times the coins were very popular; at other times, as in recent years, they were seldom seen in circulation. In 1920 this very volatile demand was aggravated by the government's announcement of a change in the standard of silver coins from 92.5% to 80% silver. About 600,000 of the 1920 and 200,000 of the 1921 fifty-cent pieces were produced, but since the demand for the new coins was very low, most of them remained in storage in the Mint. It was the Mint's routine practice to hold a small stock of coins for later issue, but such stocks of "old dates" were usually issued within one or two years. By 1929, however, when the demand for the fifty-cent coins improved, the stock of fifty-cent pieces was not only large but it was also in coins that were eight to nine years old. Fearing that the public might question the authenticity of new-looking coins bearing old dates, the Deputy Master of the Mint ordered that the stock of about 500,000 pieces be melted and that a portion of the silver be used for producing fifty-cent pieces dated 1929. It appears that most of the 1921 pieces were among those melted. The coin illustrated is part of the Bank of Canada's National Currency Collection.